The title alone is eye-catching however the content from a recent article, and the lessons learned, are priceless. 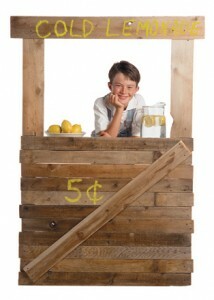 Incorporate a few more marketing ideas below based on the lessons from the lemonade stand. Your firm’s blog helps communicate what you offer. It provides a way to showcase beyond the basic services. The blog also offers a window into future service offerings from your firm. Free information, updates, and details of future offerings serve to help convert potential clients to actual clients. “Make everything you do something ‘extra special’ and clients will take notice.” The newsletter that comes out each month has new information freely available. All of this extra information for your clients is a time saver. You can do more by leveraging contact through the Email Marketing System with messages that provide contests or offerings. Other extras you might consider are easy translation, or use free screen sharing, and easy online scheduling. Help your clients sell their services and you help sell yours. Client showcasing on a regular basis via your website, is a great way to do this. “How are you ‘screaming’ about your business?” The use of Facebook, or other social platforms like Twitter, help you get the word out about your business. These often only require a few minutes a day to keep consistent information flowing and are all easily integrated onto your website. The search for immediate results often causes confusion. Try for persistence in what you do. Persistence with marketing is key. .
Be sure to capture testimonials from your clients. These are a sure fire way to “advertise your popularity.” You can then show that testimonial on your CPA website. These types of testimonials are a great way to “advertise your popularity” and help in marketing your CPA firm. What types of marketing tips have you learned from your kids or other unusual places? Send a comment below and share your story with other readers.